Ahead of 'Bring Your Dog to Work Day,' here are tips on how to make your office a welcoming place for our four-legged friends. Tomorrow is the annual Take Your Dog To Work Day. 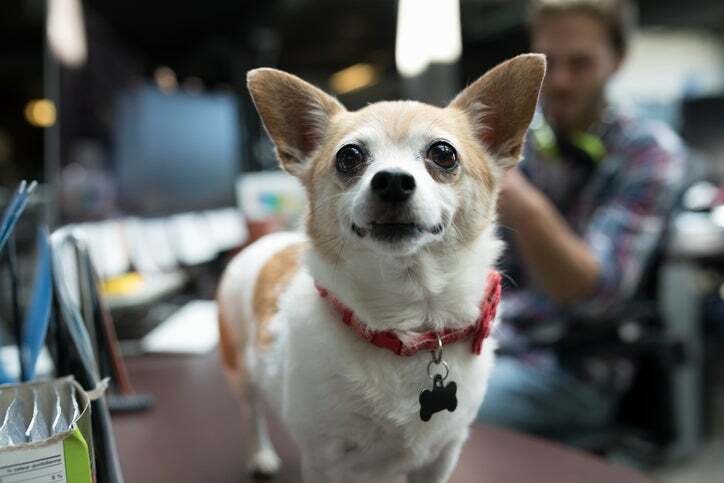 Created by Pet Sitters International in 1999, the event was conceived to “celebrate the great companions dogs make and promote their adoptions.” But many employers are realizing the benefits of pet-friendly offices, apart from Take Your Dog to Work Day. Research has found that dogs in the workplace reduce stress as well as promoting interaction among co-workers, not to mention just making your job a lot more fun. A study by Banfield Pet Hospital found that allowing dogs and other pets to accompany employees to work can attract and retain top talent, improve moral, provide a greater work-life balance, inspire company loyalty, increase productivity and create a general sense of well-being. But a dog-friendly office is not without challenges. Here are some things to consider when making your office welcome to pooches. Before going dog-friendly, employers will need to set some ground rules. First, a written policy for allowing dogs in the office will make ensure that your dog-friendly digs will provide a positive, constructive experience — for both the employees and their dogs. Guidelines for employee responsibility, procedures if rules are broken, and other pertinent information should also be outlined. Check out Pet Sitters International’s sample pet policy. 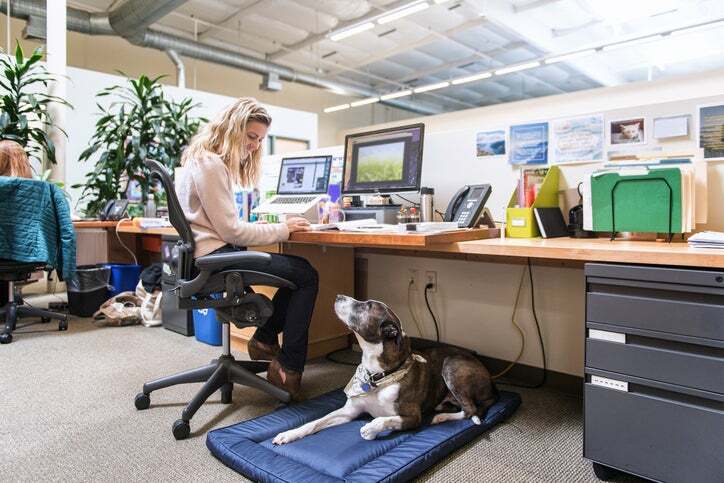 There are some very dog-devoted companies that have designed their offices with dogs in mind. 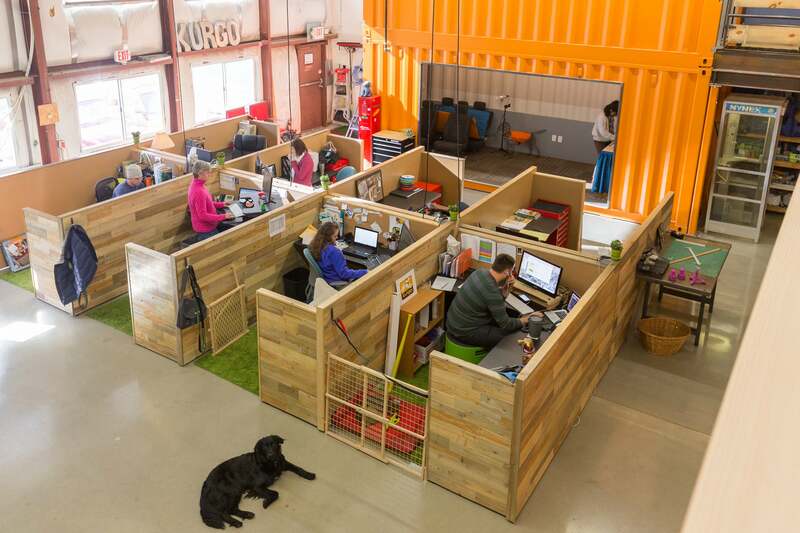 Kurgo, a leading supplier of quality dog travel supplies and accessories for active dogs, designed their office with artificial grass on the cubical floors and in play areas, low water fountains for thirsty pups, a dog shower and toy baskets. Amazon has a “doggie deck” with a fake fire hydrant, a “Dogs Only” water fountains, a 1,000-square-foot dog park, poop bag stations, designated dog relief areas, receptionists armed with dog treats, and a doggie treat truck. Are there easily accessible outdoor areas for dogs to take bathroom breaks? Is there a way to contain pets in employees’ offices or cubical space? Is there a separate space for people who don’t love dogs? 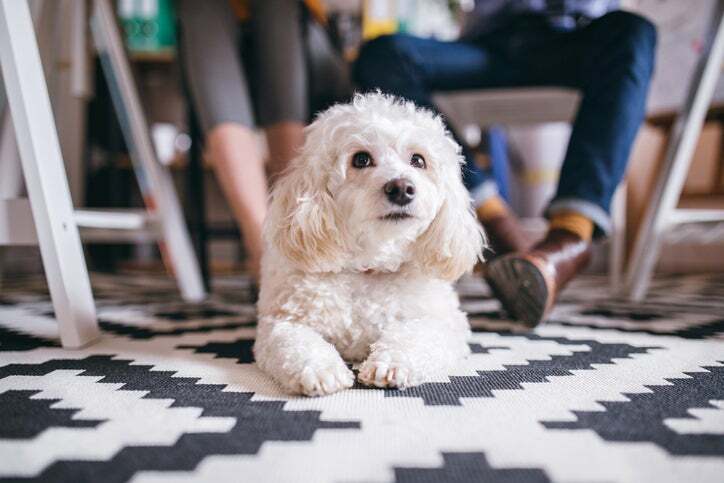 You don’t have to go crazy and completely overhaul your office, but there are a few easy ways to make your office space more dog-friendly. If you invest in some dog gear and carefully allot your space, you can make it dog-friendly for all of your workers. Water bowls: Weighted bowls in different sizes will cut down on spills. Food bowls: Try non-skid bowls, but you can ask your employees to bring their own. Have a few on hand for emergencies. Poop bags: You can get bio-degradable bags in bulk. If you have a lot of employees, consider a Dog Waste Station. Hand wipes: These rinse-free sanitizing wipes can be a lifesaver. Dog gates: Super important for keeping dogs contained, but you don’t have to spend a fortune on a sturdy gate. Dog beds: Throw a few dog beds and sofas or elevated dog beds around in different sizes to encourage quiet time. Toys: An assortment will keep dogs busy so their owners can work. Treats: It’s always good to have an assortment available for people to give to the dogs. Opt for healthy, natural treats. Lint rollers: Don’t leave home without these. Scotch Brite sells them in bulk and has refills. There are also rollers that are more earth friendly. Carpet and upholstery cleaners: Have this on hand for accidents, but choose a cleaner specifically for pet stains, like the Bissell’s Powerglide Lift Off Pet Vacuum. Puppy Pads: Potty pads are helpful for small dogs with small bladders. Odor and stain remover: Nature’s Miracle will do the job. Before any canine workers arrive, be sure to pet proof your office. Secure electrical wires and cables so dogs cannot chew through them. You can use cable shield covers, baseboard wire channels, over-floor cord protectors or cable cover tape. It’s a good idea to get wastebaskets with covers and secure kitchen garbage. Get down on a dog’s level, and pick up any choking hazards or sharp objects. Use gates to block off any areas where dogs will not be allowed. While this may all seem like a long to-do list, don’t let that deter you. Preparation is a one-time job, and the benefits of having man’s (and woman’s) best friend will be worth the work.